A lot of games I played as a kid came from video rental stores. I remember every other week I had the opportunity to pick one videogame to rent for a couple of days, usually between Friday and Sunday. A lot of the games I picked were obscure mediocre gems. At the time, I didn’t go to any gaming website for reviews or information. I simply picked a game and hoped for the best. The end result was always the same, however, no matter what I was just happy playing a new game. 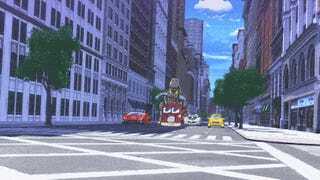 Transformers: Devastation strikes my nostalgia chord. It takes me back to a time where I wasn’t so cynical about what I was playing and just had fun. Platinum Games are no strangers when it comes to the action game genre with games like Bayonetta and Metal Gear Rising under their belt to boast, and it’s during combat when Transformers shines the most. The combat is simple but has enough room to warrant any player skillful enough to delve into its combo list, rewarding those players with more points and a higher rank at the end of a mission. Combat is fast and requires quick thinking, switching between robot mode and car mode to keep the action flowing. The two modes are dependent on each other, one second you’re releasing a devastating combo, next you’re transforming into a car, and speeding your way to the next enemy to uppercut them in their robotic chin. The game’s art style contributes a lot of the combats sensation by honoring the original 80s cartoon show with its simplistic vibrant toon-like visuals, which really adds to the mindless-fun I would get as a kid. Fans of the series will feel the dedication Platinum Games put in making the game feel and play like the 80s cartoon show, even going as far as to bring in the original American voice actors to play the part of their characters. It’s the stuff between the flashy fights and animated cutscenes that the game starts to feel sluggish and mundane. As the game has you traveling from point A to point B, Transformers starts to feel bland and really boring. At lot of it is due to the game’s environment. A majority of the game takes place in a city where the same uninspiring architect designed all the buildings. There is no sense of progression in the levels, and half of the times I felt like I was driving in circles. The only landmarks you’ll remember are the battlefields but even then you’ll have to stop and ask yourself, “didn’t I just come from here?” The answer will always be yes. You do get to play in different levels like the Autobot ship Proudstar, but those levels are few in between and the game ends at the same place it started; the city. This best represents how I felt with the menus. The developers also tried to add a tacky weapon and character customization that isn’t all that flesh out. Most of the upgrades added to a character never translated into gameplay, I couldn’t tell the difference between a level 1 shock or a level 3 shock when using a weapon. On top of that, the user interface of the customization menu felt too clunky to want to spend time in. There was a lot of back pressing to get to one section to the next. This became real apparent when I wanted to compare the attributes of one weapon to the other, but couldn’t because the weapon equipped on me didn’t show up with my other weapons. But at times it did within other sections of the weapon menu. The process became irritating when all I wanted to do was jump back in the action. This part of Transformers could be fine if you were to ignore that bit of the game, but they throw so much loot at you that by the end of a mission your inventory starts to overflow with weapons. A lot of the weapons met the same faith when I played; I either sold it or synthesize it to level up my existing weapon. 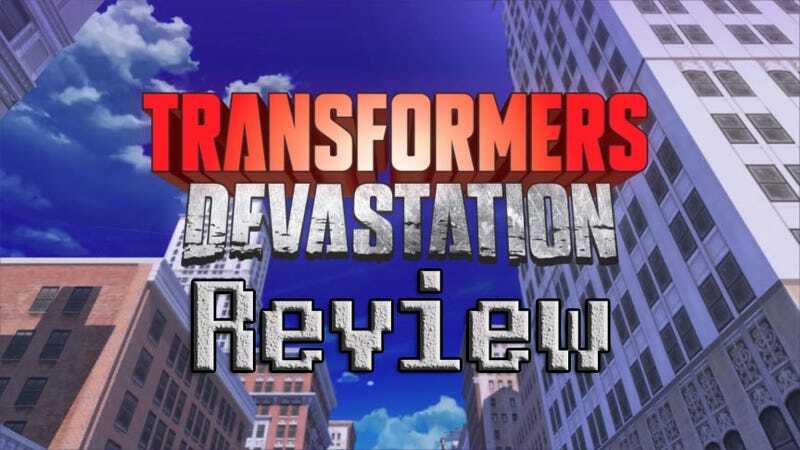 Despite the tiresome environment and unnecessary customization feature that feels added for marketing purposes, Transformers: Devastation can be fun when it wants to be. The action alone is enough to keep you playing with its epic boss battles and its entertaining gameplay. The game is perfectly crafted for any fans of the series and provides a lot of mindless fun, it feels a lot like playing a 4-5 hour long episode, but don’t go in looking for more than just mindless fun. So that is my thoughts on Transformers, but I want to know if anyone else has played it. I want to know how it stacks up to other Platinum Games. Nier: Automata is almost out. During the demo of Nier, I felt a lot of Transformers failings improved, and from what I played Nier I’m pretty excited to jump into another hack-and-slash game like it.